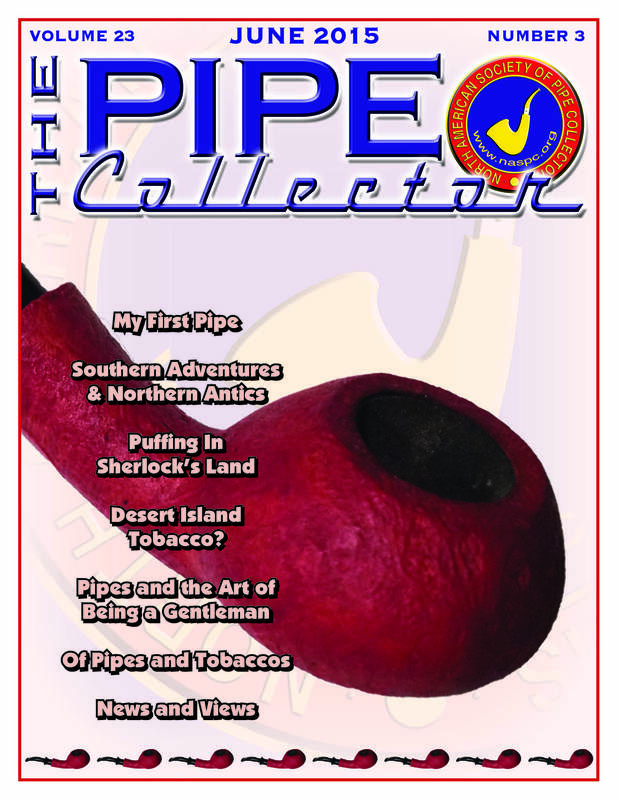 In addition to our annual show, what holds the membership together is our newsletter, The Pipe Collector (TPC), which has also gone through a couple of name changes over the years. As its editor, TPC is what Unger was especially proud of for its contributions to our hobby. What began as a semi-annual newsletter has, through the years, matured into a newsletter upwards of 60 pages per issue, distributed every other month. Actually, "newsletter" is pretty much a misnomer for TPC. Each issue is professionally laid out and printed by Jeff Knoll and Eddie Fliess, pipe smokers, NASPC members, and owners of The Graphic Touch, a graphic studio in Ohio. We now publish six issues a year. Over the years, membership contributions to TPC have increased in number and quality. Subject to good taste and relevance to pipes, members continue to submit articles on a wide variety of topics. We do accept ads, but we do not suffer space constraints based on the needs of an advertising department. Thus, we tell writers to take as long as they need to say what they want to say, and we try to publish everything that we receive. Regular and popular contributors include Regis McCafferty, Rich Esserman (known for his encyclopedic knowledge of pipes and collecting), Lou Zisholz (with his tobacco reviews), Marty Pulvers (known for his trenchant, sometimes sarcastic, wit), and others. We don't shy away from controversy either. The pages of TPC kicked off the brand versus briar and fills in high-grade pipes debates, both of which generated quite a bit of heat before they tapered off. We don't encourage controversy for the sake of controversy, but we do feel that, in addition to its wonderful friendships and fellowship, our hobby does have important issues--upon which reasonable people may disagree--as well. So we edit TPC, but we do NOT censor its contributors. John Tolle, NASPC's president and the other board members all feel that TPC is a major contributor to our hobby of pipe collecting and pipe smoking and that our membership dues are a major bargain. We currently have over 1000 members and are always looking and working for more. Our major regret is that so many members of the pipe world have not yet heard of us.